Them and Us VI.-The Gazes 2. 2.-Gaze and listen from/towards below. Can we still choose towards where and from where to look? Can we, for example, choose between looking at those who work at the supermarket chain store, ream out the workers for being complicit in the electoral fraud, and publicly ridicule the orange uniforms the employees are forced to wear, or look at the employee who, after cashing out…? “Half hour,” they say, mentally calculating the budget-time-from-the-metro-bus-walk. “Spot me some money, Roco, don’t be a jerk,” he says. “Well, wash it, dude,” says Roco. “Ok, look for it,” she says. He goes to enter a number. They navigate. They get to where there are just over 131. They play the video. “Settle down, revolutionary vanguard. You’ve got something wrong with your head if you judge people by their appearances. Just because I have light skin they call me güerita and bourgeois, and they don’t see that I live paycheck-to-paycheck. It’s important to see each person’s history and what they do, dummy,” she says, smacking him upside the head. They watch, they shut up, they listen. “So they told Peña Nieto all that to his face… they’re brave, yes, it’s obvious they’ve got balls,” he says. “Or ovaries, idiot,” and another smack from her for him. “It would be gender violence, idiot,” and another smack. They finish watching the video. “Half an hour!” Roco yells at them. “Of course, Vins is my buddy and he said that he’s tight with sockface because he let him win at Mortal Kombat, on the little machines, so all we have to do is say that we’re friends with Vins and done,” he argues enthusiastically. “Of course, speaking of witches, if I’m lucky my future mother-in-law will get stuck in the mud,” he ducks his head expecting a smack that doesn’t come. “The Sixth, not the eighth,” he interrupts. The collective van looks like it’s going to explode with people. We’ll see if the next one has room. It’s cold, it’s raining. They embrace each other more, not so that they don’t get wet, but rather so they get wet together. Far away someone is waiting, there’s always someone who is waiting. And while he waits, with an old pencil case and an old and shabby notebook, he keeps track of the gazes from below that are seen in a window. “Los Nadies,” [the Nobodys] based on the text by the same name by Eduardo Galeano. Performed by La Gran Orquesta Republicana, ska-fusión band, Mallorca, Spain. Band members include: Javier Vegas, Nacho Vegas: saxophone. Nestor Casas: trumpet. Didac Buscató: trombone. Juan Antonio Molina: electric guitar. Xema Bestard: bass. José Luis García: drums. Liliana Daunes narrates a very other story called “Always and Never Against Sometimes.” Greetings to the Network of Solidarity with Chiapas that struggles and resists here just a little ways away, in Buenos Aires, Argentina, Latin America, Planet Earth. “Salario Mínimo” (Minimum Wage) Oscar Chávez and Los Morales. Enrique Peña Nieto allegedly bought votes with grocery store gift cards with the full knowledge of the supermarket chain in question. Refers to the #YoSoy132 movement against Enrique Peña Nieto, sparked when 131 university students organized a protest against his visit to their campus. Refers to former President Felipe Calderón busting the Mexican Electrical Workers Union (SME). Calderón teaches at Harvard now. Many Spanish speakers have noted the sexism they argue is inherent in the need to feminize and masculinize nouns and adjectives. The Zapatistas in particular look for ways to use more inclusive language, and this exchanges makes reference to that. 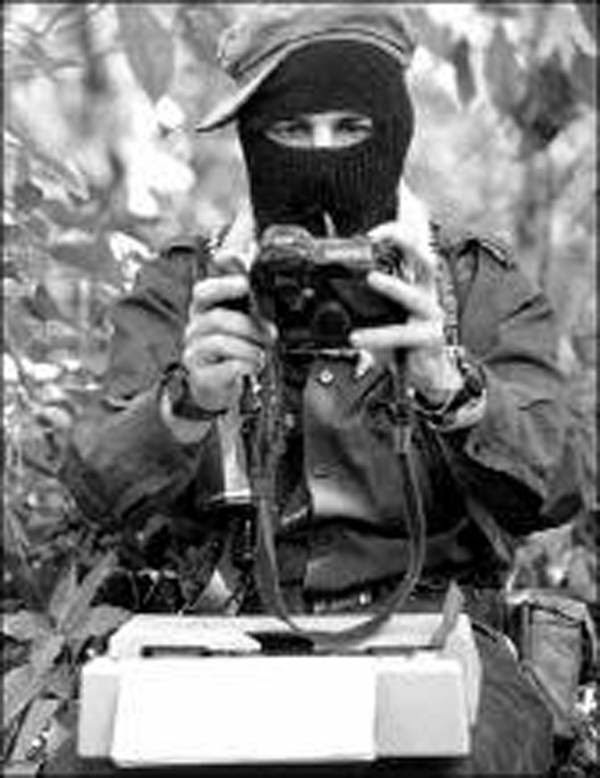 When the boyfriend says that the Zapatistas will teach us “That we’re not alone” he says “Que no estamos solos,” using the masculine form of alone (solos), which, according to the rules is what one does in mixed company. So his girlfriend responds, “Ni solas,” saying that women are also not alone.